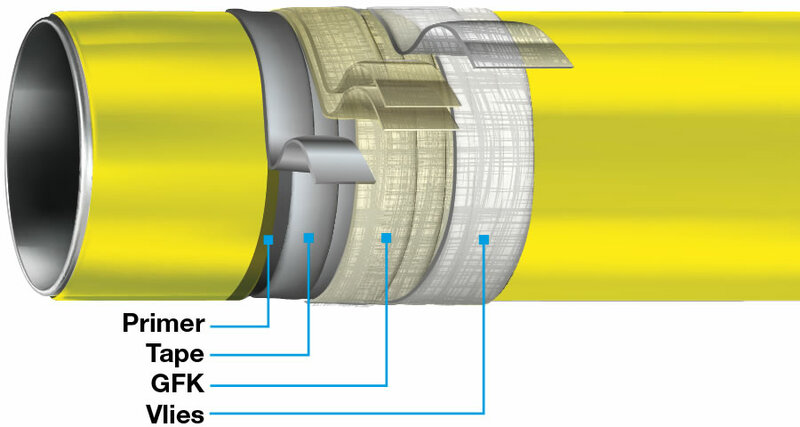 Mechanically highly resistant corrosion prevention system for pipelines, consisting of a DENSOLEN® anti-corrosion coating and the DEPROTEC®-GFK protective casing, when laying in trenchless pipeline installations, such as horizontal directional drilling (HDD) or pipe-plough methods. Especially suitable for trenchless pipe laying. The DEPROTEC®-GFK system is a reliable corrosion prevention system for pipeline structures that are subject to special mechanical stresses during installation or operation. The DEPROTEC®-GFK system consists of a DENSOLEN® anti-corrosion coating as well as the DEPROTEC®-GFK protective casing (one-component, light-curing vinyl ester resin, fleece and glass fabric). Typical applications include field joint coating of welding seams in trenchless pipeline installations, e.g. horizontal directional drilling (HDD) or pipe-plough methods, and if the pipeline cannot be bedded in sand. The DEPROTEC®-GFK system is ideal for the anti-corrosive coating of welds on pipes and pipelines, which are laid in trenchless installations by horizontal directional drilling (HDD) or pipe-plough methods. The well-balanced property profile, the fast curing time as well as the high abrasion and shear resistance and the simple processing of the DEPROTEC®-GFK protective casing have proven to be excellent in many construction projects. The unique formula of the DENSOLEN® corrosion prevention tape system guarantees durability under high corrosive loads.